The GPS tracking app for all your fitness activities. It helps you to stay motivated and reach your training goals faster by tracking, monitoring and analyzing your personal fitness performance. Select from more than 25 indoor and outdoor activities. Customizable screen to show time, speed, pace, elevation changes, heart rate, burned calories and many more. 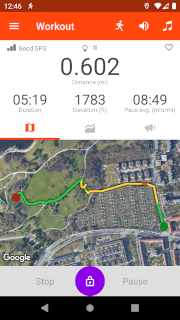 Review your workout speed by the colored track on the map. Customizable diagram for displaying speed, pace, heart rate or elevation by time or distance. Set personal goals for duration, distance, calories or interval training. Monitor your heart rate via Bluetooth. 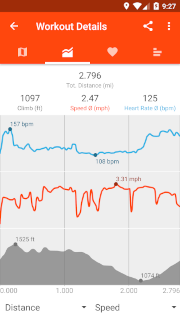 Sportractive supports most Bluetooth LE sensors like the H7 heart rate sensor for Android 5.0 and higher. Customizable voice output guides you through your workout. History of all recorded workouts. Statistical analysis of all workouts. Track your body measurement(neck, waist and hips). 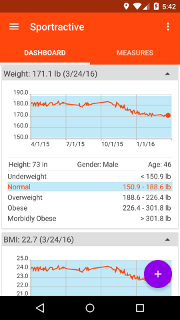 Calculation of BMI, and body fat WHtR with individual analysis over a period of time. GPX import and export lets you exchange data with other programs. This customizable screen shows you all important information of your workout at a glance. View your workout on a map. Colored segments show you the different speed. Markers indicate the distance. 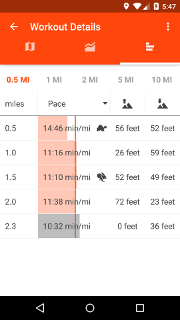 Customizable diagrams for speed, pace, heart rate or elevation by time or distance. Select one of the predefined intervals. Analyze your lap times. Check your fastest and slowest lap time. 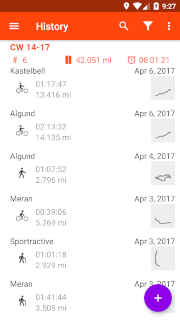 Review, import, export and edit your workout history.